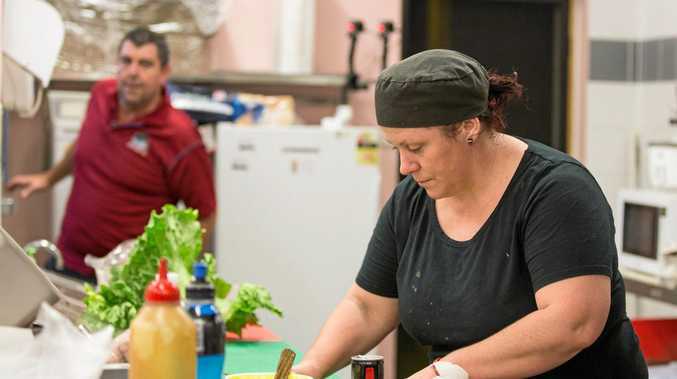 DYSART'S Penny Byrnes is confident she has broken the Guinness World Record for longest cooking marathon (individual), as she cooked continuously for 40.5 hours. During the world record attempt she served up 598 meals to customers. The old world record was 40 hours, held by a chef in the USA since March 2014. Ms Byrnes started cooking Friday at 1am and finished at 5.30pm on Saturday before going along to Dysart's Eat Street Markets event. "I stayed until 8.30pm then I went home for a shower and bed," she said. "I'm back at work today (Wednesday), it took me a few days to recover... my body and mentally." Churros, Eggs Benedict, lamb's fry, creamy garlic prawns and burgers were a few of the meals on offer during the attempt. "My legs and feet shut down," Ms Byrnes said. "I had to start taking nutritional shakes and eating protein. "At the end you start losing your mind a bit." Rules for the attempt meant she had to have two meals on the go at all times. "Everything was from scratch, no one else was allowed to help me in any cooking process," Ms Byrnes said. "I was allowed to have a sous chef who aided me in general preparation - cutting, chopping and washing up. "But I had to stay within certain restrictions of the Go Pro because it had to be filmed as well." She said no dish was particularly hard to cook but she struggled towards the end of her cooking stint. "Towards the end on Saturday the dockets became very hard to read because your mind starts to wander," Ms Byrnes said. "The support was overwhelming, there was a continual line outside the door. "We had to stop dockets at one stage, but everything got sold." Her attempt was filmed and will be sent off to be verified by Guinness World Records officials. "The record is broken now," she said. "We have to go through the video footage and send the evidence to Guinness in America and it takes eight weeks to three months to get a response back." Ms Byrnes said the attempt was to raise funds for Smiling for Smiddy and $18,500 had been raised. "Ray Smith and Aram (Drake) rode their bikes stationary for the 40 hours... they did like 11,000km, which is just insane," she said. "They're doing a ride from Alice Springs to Darwin next year so we're fundraising for that."